With 16 games left in the regular season and only a one game lead on the Miami Heat for 3rd place in the East, the Celtics are in the midst of a “make or break” portion of their season. The good news is that they’ve had their backs against the wall all year, and have responded remarkably well thus far. Since they fell to 19-19 in mid January, they’ve managed to save their season by going 20-8 in their last 28 games. They even ripped off 14 consecutive home wins before their loss to the Rockets last Friday, the longest streak for a Celtics team since 1991. Boston now has their sights set on home court advantage in the first round of the playoffs if they can maintain their current place in the standings. In order to do so, they’ll have to overcome their toughest challenge yet. Winning without their best two-way player and emotional leader. Brad Stevens announced Sunday that Jae Crowder will be “out a couple of weeks, minimum” with a high ankle sprain. Crowder has been a force for the C’s this season, and has been their most important player who isn’t named Isaiah Thomas. He leads the team in steals with 1.8 per game, good for 13th in the NBA. He’s also the best shot-blocking and rebounding wing player that the Celtics have. He’s fourth on the team in blocked shots behind big men Amir Johnson, Jared Sullinger, and Kelly Olynyk and third in rebounds behind Johnson and Sullinger. On offense, Jae’s 14.4 points per game is good for third on the team behind Isaiah and Avery Bradley and he has the highest field goal percentage (45%) of any wing player. Aside from his statistical production, what will be missed most about Crowder is his leadership. If I were to name a captain for this current Celtics team it would be #99. I’m sure he’ll do everything he can to be a motivational voice from the bench for the next couple weeks, but his on-court vocal presence will be a void that will be tough to fill. Luckily, thanks in no small part to Brad Stevens, this Celtics team as a whole seems to have a unique chemistry. I’m hopeful that they can work with Brad to overcome another obstacle, just like they’ve been doing ever since their second half turnaround in 2014-2015. 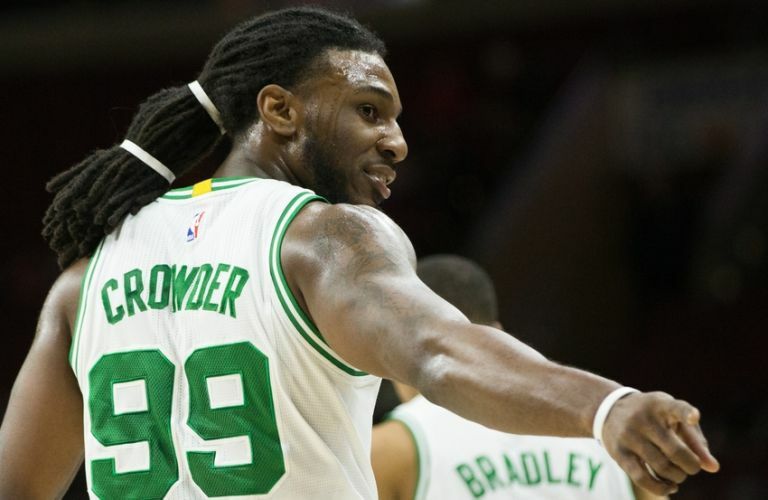 There’s obviously plenty of speculation as to how exactly the Celtics will replace Crowder in the starting lineup. The most common answer is Evan Turner, but then you’re taking away that crucial spark that he provides as a confident scorer off the bench. Regardless of who starts, replacing Jae Crowder is going to be a group effort. A lot will be placed on the shoulders of Jonas Jerebko, which could be a scary thought on the offensive end. This will also be an opportunity for 20 year-old James Young to show whether or not he’s ready to be a solid contributor in the NBA. Defensively, the C’s have their work cut out for them right away following Crowder’s injury. Their next three match-ups feature three of the best scoring small forwards in the league in Kevin Durant, Paul George, and DeMar DeRozan. Normally, Jae would be assigned to cover them. In his absence, Marcus Smart is likely the best replacement. A tall task for the 22 year-old, but Marcus has already established himself as an elite perimeter defender and he hasn’t exactly been known to back down from any challenges. It should be an interesting couple weeks for the Celtics. If they can maintain the three seed until Crowder is healthy, then Brad Stevens is a lock for Coach of the Year.